The Circuit de Spa-Francorchamps is a motor-racing circuit located in Stavelot, Belgium. It is also referred to as Spa and is the venue of the Formula One Belgian Grand Prix, and the Spa 24 Hours and 1000 km Spa endurance races. It is also home to the all-Volkswagen club event, 25 Hours of Spa, run by the Uniroyal Fun Cup. It is one of the most challenging race tracks in the world, mainly due to its fast, hilly and twisty nature. Spa is a favourite circuit of many racing drivers and fans. Designed in 1920 by Jules de Thier and Henri Langlois Van Ophem, the original course used public roads between the Belgian towns of Francorchamps, Malmedy, and Stavelot. The track was intended to have hosted its inaugural race in August 1921, but this event had to be cancelled as there was only one entrant. The first car race was held at the circuit in 1922, and 1924 saw the first running of the now famous 24 Hours of Francorchamps race. The circuit was first used for Grand Prix racing in 1925. The original Spa-Francorchamps circuit was essentially a speed course, with drivers managing higher average speeds than on other race tracks. At the time, the Belgians took pride in having a very fast circuit, and to improve average speeds, in 1939 the former slow uphill U-turn at the bottom of the Eau Rouge creek valley, called the Ancienne Douane (until 1920, there was a German Empire customs office here), was cut short with a faster sweep straight up the hill, called the Raidillon. At Eau Rouge, southbound traffic was allowed to use the famous uphill corner, while the opposite downhill traffic had to use the old road and U-turn behind the grandstands, rejoining the race track at the bottom of Eau Rouge. The old race track continued through the now-straightened Kemmel curves to the highest part of the track (104 metres above the lowest part), then went downhill into Les Combes, a fast, slightly banked downhill left-hand corner towards Burnenville, passing this village in a fast right hand sweep. Near Malmedy, the Masta straight began, which was only interrupted by the Masta Kink between farm houses before arriving at the town of Stavelot. Then, the track progressed through an uphill straight section with a few bends called La Carriere, going through two high-speed turns (the former being an unnamed right-hand turn, and the latter named Blanchimont) before braking very hard for the La Source hairpin, and that rejoined the downhill start finish section (as opposed to today where the start–finish section is before La Source). Spa is located in the Belgian Ardennes countryside, and the old circuit was, and still is, used as everyday public road, and there were houses, trees, electric poles, fields and other obstacles located right next to the track. Before 1970, there were no safety modifications of any kind done to the circuit and the conditions of the circuit were, aside from a few straw bales, virtually identical to everyday civilian use. Former Formula One racing driver and team owner Jackie Oliver was quoted as saying "if you went off the road, you didn't know what you were going to hit". Spa-Francorchamps was the fastest road circuit in Europe at the time, and it had a reputation for being dangerous and very fast – it demanded calmness from drivers, and most were frightened of it. The old Spa circuit was unique in that speeds were consistently high with hardly any let-up at all for three to four minutes. This made it an extraordinarily difficult mental challenge, because most of the corners were taken at more than 180 miles per hour (290 km/h) and were not quite flat – every corner was as important as the one before it. If a driver lifted the throttle more than expected, then whole seconds, not tenths, would be lost. The slightest error of any kind carried multiple harsh consequences, but this also worked inversely: huge advantages could be gained if a driver came out of a corner slightly faster. Like the Nürburgring and Le Mans circuits, which also ran on public roads, Spa became notorious for fatal accidents, as there were many deaths each year at the ultra-high-speed track. At the 1960 Belgian Grand Prix, two drivers, Chris Bristow and Alan Stacey, were both killed within 15 minutes (although Stacey's accident was caused by a bird hitting him in the face) and Stirling Moss had crashed at Burnenville during practice and was severely injured. When Armco crash barriers were added to the track in 1970, deaths became less frequent, but the track was still notorious for other factors. The Ardennes forest had very unpredictable weather and there were parts where it was raining and the track was wet, and other parts where the sun was shining and the track was completely dry. This factor was a commonality on long circuits, but the unpredictable weather at Spa, combined with the fact that it was a track with all but one corner being high-speed, made it one of the most dangerous race tracks in the world (if not the most). As a result, the Formula 1 and motorcycle Grands Prix and 1000km sportscar races saw smaller than usual fields at Spa because most drivers and riders feared the circuit and did not like racing there. Multiple fatalities during the 1973 and 1975 24 Hours of Spa touring car races more or less sealed the old circuit's fate, and by 1978, the last year Spa was in its original form, the only major races held there were the Belgian motorcycle Grand Prix and the Spa 24 Hours touring car race; the 1000 km World Sportscar Championship race no longer took place after 1975 and did not come back until 1982. In 1969, the Belgian Grand Prix was boycotted by the F1 drivers because of the extreme danger of Spa. There had been ten car racing fatalities in total at the track in the 1960s, including five in the two years previous. The drivers demanded changes made to Spa which were not possible on short notice, so the Belgian Grand Prix was dropped that year. Armco barriers were added to the track and sections of it were improved (especially the Stavelot and Holowell sections), just like they had been added for the 1969 Le Mans race. One last race there the following year on the improved track was still not satisfactory enough (even after a temporary chicane was added at Malmedy just for that race) for the drivers in terms of safety, and even with the chicane, the drivers averaged 150+ mph (240 km/h) during the race. For the 1971 race, the track owners and authorities had not brought the track up to date with mandatory safety measures, and the race was cancelled. Formula One would not return to Spa until 1983 on the modern track. The Masta Kink "was by far the most difficult corner in the world", according to Jackie Stewart , requiring skill and bravery in equal measure to get it right. After a long run from Malmedy, the cars would reach top speed before having to negotiate Masta, a high speed left-right chicane, and a good exit speed was vital as it was followed by another long straight run to Stavelot. This was a very fast and very dangerous corner, as it was situated right in the middle of two long unbroken straights, both about 1½ miles (2.4 km) long. The speed in this sector could reach 190 mph (305 km/h). Masta was lost to F1 racing after the 1970 season. Jackie Stewart's crusade to improve safety in racing was set in motion by his crash there in 1966, when his BRM ended upside-down in the cellar of the farmhouse on the outside of the corner, with fuel gushing out of the tank onto Stewart, (who had also broken his ribs). At this point, many of the Formula One drivers disliked Spa (including Stewart and Jim Clark, who had some of his greatest wins there) because of the immense speeds that were constant on the track. While he was spectating at the 1972 12 Hours of Sebring, Stewart attempted to organise a boycott of the Spa 1000 km race that year, a move that was not respected by many of the drivers, because Spa was still popular with racing drivers outside of Formula One. Stewart later compared the old Spa circuit in 1986 as being as "ferocious as a tiger", and he later described Masta in an interview in 2011 as perhaps the hardest corner on any racetrack he raced on in his career; even more so than Eau Rouge. Another particularly gruesome story comes from the 1972 24-hour touring car race. During one of his pit stops at night, Hans-Joachim Stuck shouted to his co-driver Jochen Mass over the noise from the cars that he should "look out for body parts at the Masta Kink". Mass arrived there expecting to see pieces from cars all over the road but was appalled to discover it was in fact the remains of a marshal. After Masta, and at the end of the subsequent Holowell Straight, there used to be a sharp hairpin at the entrance to the town itself, which was later bypassed by a quicker, banked right hand corner. Another fast section of road in the forest leads to Blanchimont. Here, the new short Grand Prix track of 1979 joins the old layout. 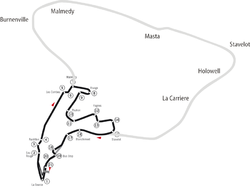 Eighteen Formula One World Championship Grands Prix were run on the Spa-Francorchamps circuit's original configuration, which was boycotted by F1 in 1969, before the revised circuit banished it to the history books in 1979. The lap record of the old triangle-shaped track is 3 minutes and 13.4 seconds, held by the French driver Henri Pescarolo, driving a Matra at the 1973 Spa 1000 km World Sportscar Championship race at an average speed of 262 kilometres per hour (163 mph), but the fastest ever recorded time of the old Spa circuit was the pole position time for the very same race—3 minutes and 12.7 seconds by Jacky Ickx in a Ferrari 312PB. Over the years, the Spa course has been modified several times. The track was originally 15 kilometres (9 mi) long, but after World War II, the track underwent some changes. In 1930, the chicane at Malmedy was eliminated and bypassed, making the course even faster, but the chicane was re-installed in 1935, albeit slightly different. In 1939, "Virage de Ancienne Douane" was eliminated and cut short, thus giving birth to the Eau Rouge/Raidillon uphill sweeping corner. In 1947, the chicane at Malmedy was again eliminated and bypassed, and was made part of the Masta Straight. The slight right-hander that was originally Holowell (the corner before Stavelot after the second Masta Straight) was eliminated. And finally, instead of going through a slight left-hander that went into the town of Stavelot and a sharp right-hander at a road junction in Stavelot, a shortcut was built that became a very fast, very wide right-handed turn that bypassed Stavelot. All these changes made the final configuration of the old Spa circuit 14 km (9 mi) long, and also made Spa the fastest open road circuit in the world. In the final years of the old circuit, drivers could average 150 mph (241 km/h). The biggest change, however, saw the circuit being shortened from 14 km (9 mi) to 7 km (4 mi) in 1979. 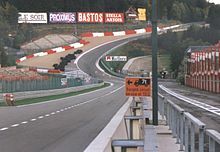 The start/finish line, which was originally on the downhill straight before Eau Rouge, was moved to the straight before the La Source hairpin in 1981. Like its predecessor, the new layout is still a fast and hilly route through the Ardennes where speeds in excess of 330 km/h (205 mph) can be reached. Since its inception, the place has been famous for its unpredictable weather, where drivers are confronted with one part of the course being clear and bright while another stretch is rainy and slippery. The circuit probably demonstrates the importance of driver skill more than any other in the world. This is largely due to the Eau Rouge and Blanchimont corners, both which need to be taken flat out to achieve a fast run onto the straights after them, which aids a driver in both a fast lap and in overtaking. The most famous part of the circuit is the Eau Rouge and Raidillon combination. Having negotiated the La Source hairpin, drivers race down a straight to the point where the track crosses the Eau Rouge stream for the first time, before being launched steeply uphill into a sweeping left-right-left series of corners with a blind summit. Properly speaking, the Eau Rouge corner is only the left-hander at the bottom. The following right-hander that leads steeply uphill, which was introduced in 1939 to shortcut the original Ancienne Douane hairpin, is called Raidillon. The corner requires an amount of skill from the driver to negotiate it well and the long Kemmel straight ahead produces good overtaking opportunities for drivers at the following "Les Combes" corner. The corner was tighter and narrower (it was made wider in 1970, when the circuit was updated) on the old circuit than it is today, allowing drivers to take the corner faster. —  "You come into the corner downhill, have a sudden change [of direction] at the bottom and then go very steep uphill. From the cockpit, you cannot see the exit and as you come over the crest, you don't know where you will land. It is a crucial corner for the timed lap, and also in the race, because you have a long uphill straight afterwards where you can lose a lot of time if you make a mistake. But it is also an important corner for the driver's feeling. It makes a special impression every lap, because you also have a compression in your body as you go through the bottom of the corner. It is very strange – but good fun as well." A challenge for drivers has always been to take Eau Rouge/Raidillon flat out. Touring cars can take the corner at 160–180 km/h, and Formula One cars at over 300 km/h due to high downforce. World Champion Jacques Villeneuve once spoke of the effects of downforce, saying that to get through the corner the drivers have to drive faster, because downforce increases the faster a race car goes. Without lifting the throttle through Eau Rouge, a car would be flat out from La Source, along the Kemmel straight to Les Combes, a total distance of 2.015 km. A loss of control through this section can often lead to a very heavy shunt, as usually the rear end of the car is lost and the resulting impact is often lateral. Several famous racing drivers have crashed while driving through Eau Rouge/Radillon, including Stefan Bellof in a Porsche sportscar, Guy Renard during the 1990 24h of Spa-Francorchamps in a Toyota Corolla GT, and Alex Zanardi in a season-ending crash during a practice session of the 1993 Belgian Grand Prix in a Lotus. Jacques Villeneuve suffered a spectacular crash at the top of Radillon in qualifying during the 1999 Belgian Grand Prix which he described as "My best-ever crash". His teammate Ricardo Zonta followed Villeneuve by having a similar accident later in practice, leading cartoonist Jim Bamber to show BAR boss Craig Pollock telling Zonta: "Jacques is the quickest through Eau Rouge, so go out there and do exactly what Jacques does…" It was revealed later that Villeneuve and Zonta had a personal bet to see if either could take the corner flat out. Following the deaths of Roland Ratzenberger and Ayrton Senna at Imola in 1994, the following F1 races saw the introduction of chicanes made up from stacked tyres. The entry to Eau Rouge was obstructed in such a way in 1994, although it was returned to its previous configuration the following year. The corner was slightly modified for the 2002 Belgian Grand Prix. Testimony to the fame and beloved character of the Eau Rouge corner can be found in fans' reaction to the Istanbul Park circuit in Istanbul, Turkey. When fans first got to see the course configuration at the start of the weekend of the 2005 Turkish Grand Prix, they noted that an uphill kink on the back straight was very similar to Eau Rouge; the kink was therefore jokingly dubbed "Faux Rouge" (a pun on the name of the original Spa corner using the French word "faux", meaning "false"). The Blanchimont high-speed left-hand turn, present in both the old 14 km circuit and the new, shorter, 7 km track, is the final sweeping corner of the track before the chicane, which leads to the pit straight. This turn and the approach to it have caused serious accidents over time, the most recent being in 2001, when Luciano Burti lost the front wing of his Prost due to a clash with Eddie Irvine's Jaguar, losing front downforce and steering, leaving the track at 185 mph (298 km/h) and piling into the tyre wall, the impact knocking him out and burying the car into a mound of tyres. Problems have also occurred in lower classes of racing with Tom Kristensen having a very violent crash in a Formula 3000 car in 1997 after running wide on the entry to the Blanchimont turn and subsequently hitting the wall, throwing the monocoque back out in the middle of the track, where it was hit by numerous cars before coming to a complete halt. The run-off area is narrower than in other turns taken at this speed, and behind the protective barriers there is a 7–8 meter drop. This is the first turn taken by the cars after the new track rejoins the route of the old 14 km track. Blanchimont was also the scene where in 1992 after Érik Comas had crashed heavily during Friday's session, Ayrton Senna stopped, disembarked his car and sprinted to help the injured driver, with other cars driving past at racing speeds. With the 2018 Belgian Grand Prix in August, turn 11 will be named after famous Belgian racing driver Jacky Ickx as a tribute to his career. This corner with no official name is known by most drivers as "speakers corner". This name originates in the fact that it was the first corner the "Speaker", the man at the microphone during races, could see the cars after they disappeared into the forest after Raidillon, thus reporting who was in the lead. Due to the introduction of the Television Without Frontiers Directive (1989), tobacco advertising and sponsorship on television were banned within the European Union from 1991. Formula One faced a major threat regarding races in its historical European heartland. Due to these political and legislative circumstances, the Grand Prix at Spa was left out of the 2003 calendar as a response to the internal tobacco legislation in Belgium. The event was tagged as a world class event within the national senate, and thus it was saved for the 2004 Formula One season. The final Bus Stop chicane was reprofiled for 2004 with an additional sweep to the right. Spa was dropped from the Formula One calendar in 2006. The organiser of the event went bankrupt in late 2005, and therefore the planned improvements to the race track and paddock had not yet been made. 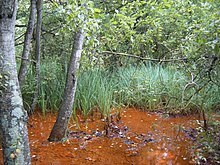 The Wallonia government stepped in and provided the necessary funds, but too late for the 2006 race to take place. From 2007 tobacco advertising bans limited the number of sponsors from the industry finding the sport appealing. From 2010, only the Scuderia Ferrari Marlboro still had tobacco branding; soon after that the team dropped the Marlboro "stripes" from their race cars after accusations of it being linked to subliminal advertising. With a new financial backer, the renovation started on 6 November 2006 and finished in May 2007, costing around €19 million. Formula 1 returned to Spa for 2007, with a modified track layout. The Bus Stop chicane was moved back towards Blanchimont and the La Source hairpin moved forward. This allowed more space for the new pit lane. The modifications gave a longer start/finish straight. New asphalt runoff was added to the inside and outside of Les Combes for the 2010 race, in line with the prevailing trends at other Formula One circuits. Prior to the 2013 race, drainage grooves were cut into the asphalt on the start–finish straight, underneath the first 11 grid slots. Drivers were initially concerned that this would affect grip at the start. Besides Formula 1 other races in different motorsports classes are hosted at Spa-Francorchamps. The most notable ones are the Blancpain Endurance Series, the Formula 3, the RCN, the Motorbike Endurance, the ADAC GT Masters, and previously the DTM and the WTCC. The most famous long-distance and sports car races are the Spa 24 Hours and the 1000 km Spa. The circuit also hosts a 24-hour 2CV race. As the long-time home of the Belgian Grand Prix and its location within the Ardennes forests it has been a popular backdrop for all kinds of fictional media, from appearances in comics and motion pictures, to regular appearances in dozens of video games across almost all formats going back into the 1980s. The circuit has been used several times in the Tour de France cycling race. In 1980, the circuit was part of an individual time trial stage, won by Bernard Hinault (Renault–Gitane); while in 1989, several laps of the circuit were completed before the finish of the third stage, which was won by PDM–Concorde's Raúl Alcalá. In 2017, the circuit was used as part of the third stage, starting in Verviers, Belgium and ending in Longwy, France. The area of Spa-Francorchamps is often rainy or having cool air temperatures, which has led to Formula One events such as the 1998 14-car pileup on a waterlogged track and the dramatic finish to the 2008 event, when rain fell during the last few laps after an all-dry race. The Royal Meteorological Institute runs weather stations both in Stavelot and in Malmedy, which both show similar oceanic climates with some interior influence. Although temperatures generally often stay above freezing in winter, snowfall is quite common. During summer, temperatures most often remain in the low 20's, with frequent cloud cover and showers. With the World Endurance race running in spring and the Formula One race in late summer, hot temperatures during high-profile events are very rare. Nürburgring (nearby fellow historical circuit in Germany). ^ Hamilton, Maurice (5 November 2008). "Belgian GP: different strokes". Top Gear. Archived from the original on 16 July 2012. Retrieved 2011-01-22. ^ Reiman, Samuel. "F1: Michael Schumacher's 10 greatest drives". Retrieved 2 September 2016. ^ "Kimi Raikkonen and the romance at Spa Francorchamps". 29 August 2014. Retrieved 2 September 2016. ^ a b c d "Circuit History". Circuit de Spa Francorchamps. Retrieved 22 January 2011. 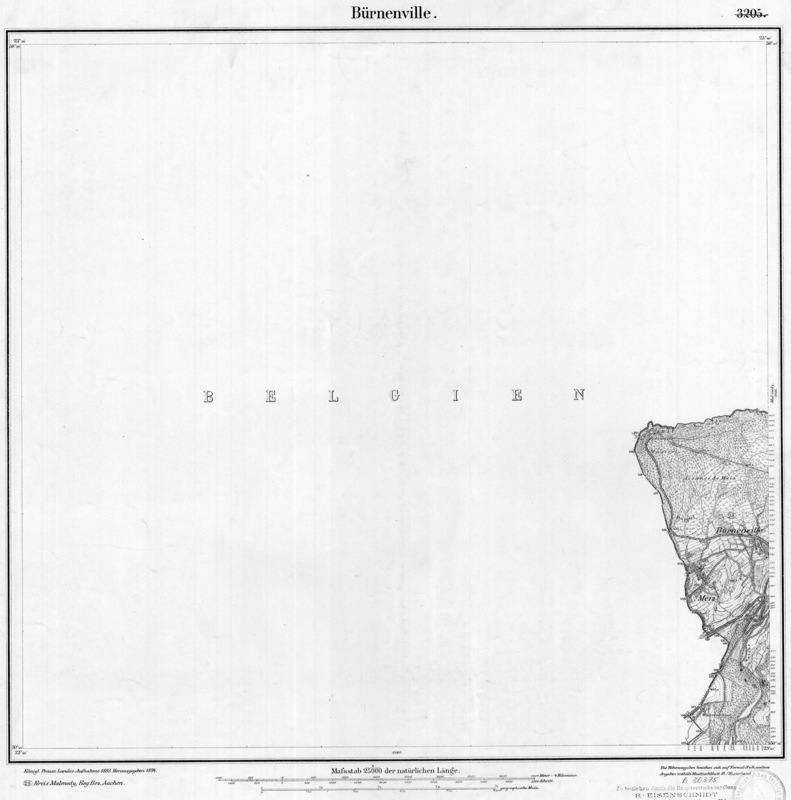 ^ "Deutsche Topographische Karte "5501 Bürnenville", Ausgabe 1893". uni-greifswald.de. Archived from the original on 19 July 2011. Retrieved 25 June 2018. ^ Velocity (3 March 2012). "Grand Prix: The Killer Years". Retrieved 25 June 2018 – via YouTube. ^ "Spa-Francorchamps". ESPN F1. ESPN EMEA Ltd. Retrieved 1 September 2010. 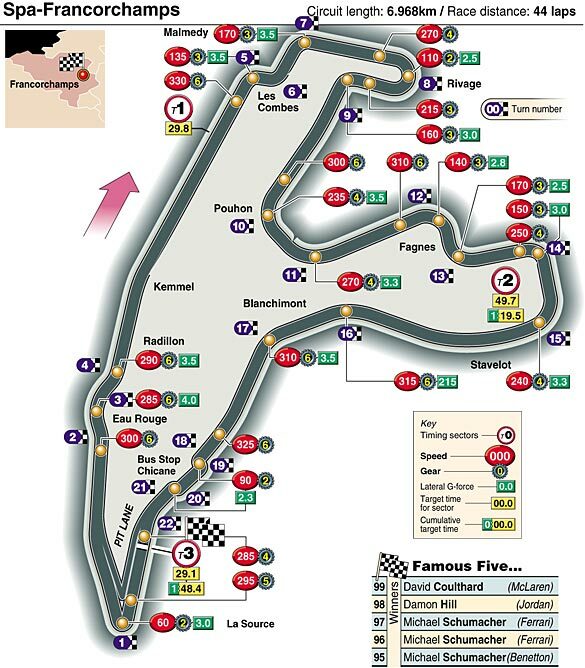 ^ "F1 performance map at Spa-Francorchamps". autosport.com. Retrieved 25 June 2018. ^ Tom Bellingham. "This Is What Happened When Two F1 Drivers Made A Dare At Spa". wtf1. Retrieved 4 October 2018. ^ "Istanbul Park". Retrieved 30 August 2016. ^ "Spa-Francorchamps réserve une surprise à Jacky Ickx - France Racing". franceracing.fr. 20 June 2018. Retrieved 25 June 2018. ^ "Television Without Frontiers Directive 1989". EU. Retrieved 11 May 2017. ^ Grant-Braham, Bruce; Britton, John (2012). "Motor racing, tobacco company sponsorship, barcodes and alibi marketing". Tobacco Control. 21 (6): 529–535. doi:10.1136/tc.2011.043448. PMC 3595501. PMID 21821820. ^ 2cvRacingTeams. "24h02' 2cv - Spa Francorchamps". www.24h2cv.be. Retrieved 25 June 2018. ^ O'Keefe, Tthomas C. (1999). "GRAND PRIX REDUX: The Italian Stallion Does Maranello". Atlas F1. Kaizar.Com, Incorporated/Autosport. Retrieved 23 August 2012. ^ "La Etapa de Hoy" [Today's Stage]. El Mundo Deportivo (in Spanish). 3 July 1989. p. 42. Retrieved 3 July 2017. ^ "Stage 3: Verviers to Longwy". Tour de France. Amaury Sport Organisation. Archived from the original on 7 July 2017. Retrieved 3 July 2017.